Source of title proper: Title is based on the contents of the photograph. 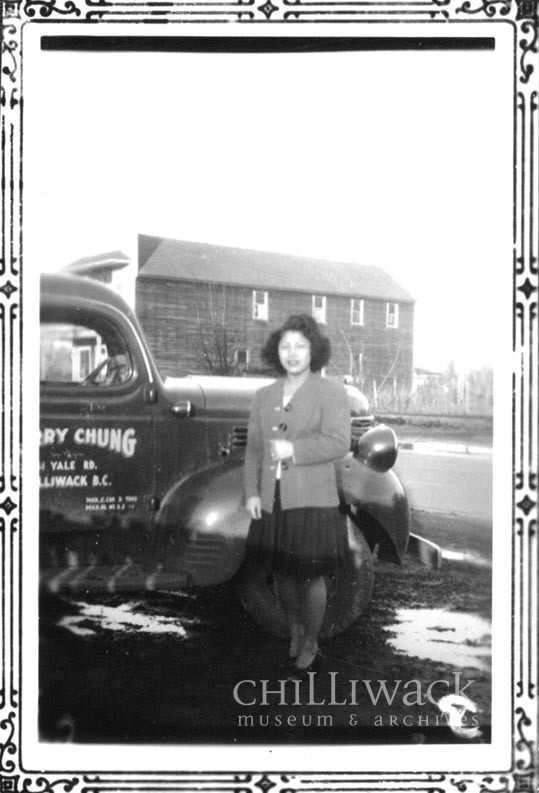 Photograph shows Dorothy Chung (Kostrzewa) standing beside truck belonging to her brother Harry Chung at the Chung family home on Yale Road West (west side of the road, former site of Fraser Valley Frosted Foods). Chinese Masonic Hall visible in the background (side of Gray's veterinary clinic in 1989). No Reproduction without prior written approval of the Chilliwack Museum and Archives. Finding aid available at the Chilliwack Museum and Archives.